There’s been so many bloody ABBA specials it’s near-impossible to discern one from another. Only a true afficionado can separate the wheat from the chaff. Do we really need to know how many albums Australian TV stars accrued in the 70s? This version shifts the focus from ABBA’s career, fan frenzy and memorabilia to the movie. In this sense therefore, it’s predominantly a “Making Of” -not that there’s anything wrong with that. To set the scene there is of course background on the meeting of the foursome, Eurovision and their chart success and parting in the 80s. Significantly Australia was pivotal in the success of ABBA, and particularly Mamma Mia. It was Molly Meldrum and Countdown that insisted the record company release it as a single, where it soared -though the special doesn’t specifically name either. 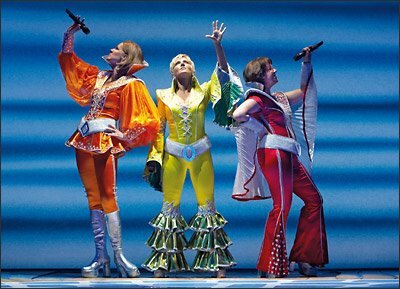 There is some excellent footage of Mamma Mia stage shows, auditions and rehearsals with interviews by Benny and Bjorn. Meryl Streep, Colin Firth, Pierce Brosnan and Julie Walters also talk about shooting the movie, linking various location shoots. The preview disk bore none of the celebrity appearances of Kylie Minogue, Geri Halliwell or Dawn French, promised in Seven’s guide. Throughout this predominantly promotional hour, the music of two genius songwriters, together with the sound of Agnetha and Frida, remains an irresistible quality. For pure pop they must surely sit alongside Lennon / McCartney and Bacharach / David. Fans of the music will find this an easy, infectious hour. ABBA: Mamma Mia! Story airs 6:30pm Sunday on Seven. The first time I saw Abba, was singing Mamma Mia on a Saturday afternoon repeat of Countdown in 1975 at my Auntie’s place. From that moment a lifetime love affair with the Supergroup began.